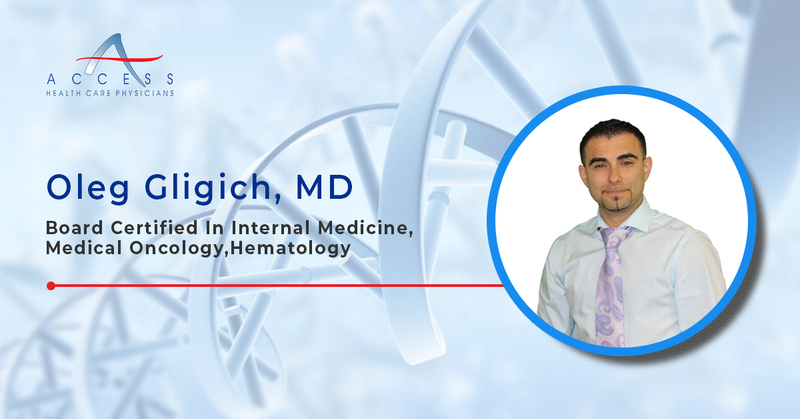 Access Health Care is happy to announce that Dr. Oleg Gligich is now Board certified in Internal Medicine, Medical Oncology and Hematology. Dr. Gligich has participated in several projects with the leaders of the Montefiore Medical Center Cancer program. He is the author of several publications, abstracts, and posters in the areas of hematology and medical oncology. He has participated in a wide range of clinical extracurricular activities, and his volunteer experience ranges from the American Cancer Society in Baltimore, the Memorial Sloan Kettering Cancer Center in Manhattan, and the Menorah Home and Hospital in Brooklyn, New York. He holds memberships in the American Society of Clinical Oncology and American Society of Hematology. To book an appointment with Dr. Gligich, visit http://www.ahcpllc.com/dr-oleg-gligich.php. The office of Dr. Gligich is located at 11373 Cortez Boulevard, Suite 200, Brooksville, Florida 34613. For more information call on 352-597-4998. Advanced Cancer Treatment Center is the oncology and hematology arm of Access Health Care. The clinical team is led by Richard Caradonna, MD, V. Rao Emandi, MD, FACRO (Fellow of the American College of Radiation Oncologists), Fadi Nakhl, MD, and Oleg Gligich, MD. They are joined by Elizabeth Morgan, ARNP, AOCN (Advanced Oncology Certified Nurse). This team represents 125 years of cumulative experience in various aspects of oncology. Access Health Care Physicians, LLC is a multi-service medical practice consisting of over 175 healthcare providers and over 915 employees at more than 110 locations throughout Florida. Access Health Care Physicians, LLC main office is located at 5350 Spring Hill Drive, Spring Hill, Florida 34606. For information call 352-688-8116 or go to www.ahcpllc.com.